tim duncan is not known for his outside shooting. well, he can shoot it with the best of them in the preimeter but this guy has never taken a lot of threes in his career. he doesn't need to since he's got a great inside game. 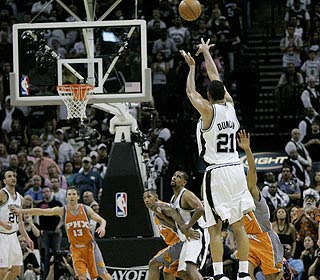 but when the san antonio spurs needed a three, tim duncan proved that he is indeed clutch as he sank a three with seconds left to force a second overtime. the spurs would go on to beat the phoenix suns 117-115.
tim duncan finished with 40 points, eclipsing lebron james' 32-point outing as well as chris paul's 35 points for the hornets. the big man also grabbed 15 rebounds and dished out 5 assists. tony parker scored 26 and manu ginobili scored 24 off the bench. michael finley added 13 for the spurs. the game would have gone to a third overtime if not for ginobili who, with 15 seconds drive to the basket and made a layup. amare stoudemire led the suns with 33 points but fouled out in the first overtime period. shaq was in foul trouble for most of the game and only finished with 11 points and 5 rebounds. steve nash had a great game finishing with 25 points and 13 assists. the suns will be looking to take one game in san antonio before the series goes to phoenix for games 3 and 4 of the best-of-seven series.